Mandatory Housing Affordability (MHA) legislation and the rezones of urban villages in neighborhoods citywide are moving forward in the Seattle City Council with a final vote scheduled in March, 2019. What is the current rezone proposal being considered by the City Council? The Mayor and the Office of Planning and Community Development drafted maps for new zoning in all neighborhoods and introduced it to the city council in the form of legislation after a challenge to the Environmental Impact Statement was mostly upheld by the Hearing Examiner. The Executive or Preferred legislative proposal for Rezoning Crown Hill Urban Village would change the zoning along arterials and in most blocks between 18th Ave NW and 12th Ave NW to Lowrise 1 or greater. Lowrise 1 zoning encourages townhouses and rowhouses; Lowrise 2 zoning and higher encourages larger development like apartment buildings. The map of the Executive’s office proposal for rezoning. 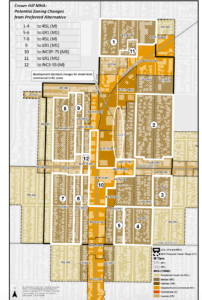 (View the proposed Executive/Preferred map in current Legislation for Rezones Citywide and for Crown Hill Urban Village). What are the proposed amendments to the current CHUV rezone proposal? Councilmember Mike O’Brien has offered extensive amendments (legislative changes) to the proposed Executive’s legislation for CHUV. The proposed amendments would adjust the zoning between 18th Ave, NW and 12th Ave, NW from Lowrise zoning and greater to a zoning designation called Residential Small Lot (RSL) and greater. Residential Small Lot zoning encourages a broader mix of housing options than low-rise zoning. The proposed amendments would also change the zoning of buildings along arterials, and include zoning adjustments to help encourage more density and inclusive affordable housing in the areas available in our community for development where there are currently big box stores and empty parking lots. The proposed amendments that Councilmember O’Brien is offering are more consistent with the broad recommendations from the CHUV Committee for Smart Growth and community feedback. What could housing and buildings look like under these zoning designations? View summaries and examples of the types of housing that would be allowed under each proposed zoning designation (RSL, Lowrise, Neighborhood Commercial, etc). Neighbors can comment on the rezoning proposal and the proposed amendments for CHUV by contacting Councilmember’s offices. Neighbors can also attend a public hearing on Thursday, February 21st, 5:30 at City Hall. See tips for commenting at a public hearing. Neighbors can follow the City Council proceedings directly by signing up for updates on the City Council Select Committee for Mandatory Housing Affordability website, viewing meeting agendas and videos and seeing the full schedule. Votes on individual amendments are scheduled for February 25th. The final vote on the MHA rezones is scheduled March 18th, 2019. Do you have questions? Email info@crownhillurbanvillage.org and of our neighbor volunteers can try and help. Thanks.